As part of the Green Flag Award Scheme and the Olympics legacy, Greenwich Council is keen to stimulate the use of our parks and open spaces, and increase the fitness of residents. In support the council plans to install a small trim trail in Eaglesfield Park by the end of March 2012 and is seeking your view on the style of equipment and proposed location. You can meet the Parks and Open Spaces team on Monday 26 September, from 4:30 to 8pm, at the drop-in public consultation session at the Shrewsbury House Community Centre, Bushmoor Crescent. A display will be available where you can learn more about the proposal, and ask the parks team any questions. It will only take about 10 minutes and you’ll have a chance to complete a simple questionnaire to register your views. So why not pop along and share your thoughts on changes taking place in the community. 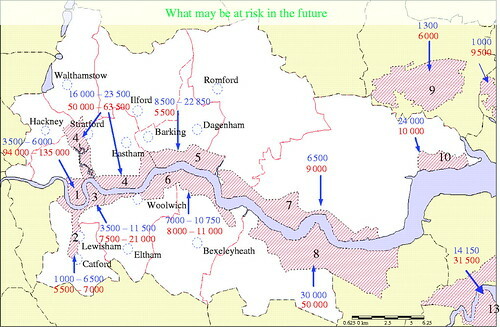 (1) Isle of dogs, (2) Greenwich, Deptford and Lewisham, (3) Greenwich Peninsula, (4) Stratford, Leaside and Royals (impact on Hackney Wick and Layton Goodsyard), (5) London Riverside (Banking and Havering riverside), (6) Charlton and Crayford (Woolwich, Belvedere and Erith), (7) Thurrock, (8) Ebbsfleet/North Kent, (9) Basildon, (10) Shellhaven. New homes (blue) and new jobs (red), 2001–2016 and beyond. ‘In the summer of 1979, Margaret Thatcher’s Environment Secretary, Michael Heseltine, flew over the docks in a helicopter and famously said: “Nothing’s happening – something must be done”, and he wasn’t talking about Buckinghamshire. As part of London Open House weekend, I joined the audience on a civil engineering boat tour sailing downstream from The Dome to Tilbury/Gravesend and back on a catamaran from the Thames Clipper fleet. It was essentially a guided tour of the past, present and future of the Thames Gateway, featuring a great deal of expertise, and at times what felt like a great deal of brainwash. The tour was kicked off by Woolwich M.P. Nick Raynsford who gave a lively introduction in which he said the most important thing about the Millennium Dome was that it introduced the tube to this part of London, paving the way for current developments on the Peninsula. He also suggested that the lack of tube access to Canary Wharf necessitated Crossrail. He then stressed the importance of sustainable development, smirking whilst recounting that as a GMV resident, his ‘cold quarter’ energy bill was only £95, an important factor in reducing CO2 pollution. He finished off by raising the not uncontroversial issue of how to handle all the waste water produced by London’s growing population and rainfall, now it’s finally outgrowing Sir Joseph Bazalgette’s Victorian sewerage system. He then handed over to the panel of experts: Jean Venables, an experienced civil engineer with an encyclopaedic knowledge of the Thames in relation to pollution and flooding; The Chief Executive of the London Thames Gateway London Partnership; and a Civil Engineering specialist on Waste Management. Jean Venables is a distinguished engineer who described her work on the river as “extremely satisfying.” She began by drawing our attention to the rushes around the dome, which she was involved in planting, indicating that they made excellent flood defences as they also give habitat to the species now moving into the cleaner river. Afterwards she talked about her career processing waste at Crossness, re-oxygenating the Thames when the sewers outflow into the river (she still advises against swimming in the river by the way), and then concentrated largely on her involvement in flood protection. In a discussion about the Thames Barrier and the 35 other major floodgates, 400 minor ones, and 337?km of tidal walls, she pointed out that the Barriers have been closed “in anger” over 100 times since 1983, adding that the newspapers are reluctant to report the saviour of London. She also explained why flooding happens by comparing low pressure over the atlantic to someone drinking through a straw – apparently the ocean rises by 3-5 inches, flooding tidal rivers as a result. Furthermore the lower half of Britain is actually sinking, whilst Scotland is raising up, in a process that will continue to around 2030, at which point the Thames Barrier is set to become incapable of protecting the city any longer. This means that the coming development of 226,000 houses along the riverside should also include new flood defences along the Thames and its tributaries. The Chief Executive of the Thames Gateway Partnership set the scene for her talk by invoking Michael Heseltine’s famous reimagining of the eastern Thames region from the point of view of a helicopter…despite that fact that we were actually on a boat. She then proceeded to use Raynsford’s earlier comments on the importance of transport to launch into familiar old arguments used by the Eastern London Road Lobby. Showing a startling lack of sensitivity, she expressed open disdain for the Londoners who’ve repeatedly beaten bridge and motorway building schemes in South East London. The all too familiar brainwash took in the usual arguments: lack of crossings between Blackwall and Dartford (er, apart from the Woolwich Ferry, the Thames Clippers, the foot tunnels, the DLR, and the coming cable car and Crossrail routes you mean? ); and the old “Do you get stuck in Blackwall Tunnel” mantra (er no actually, I check londontraffic.org or catch the DLR or a Thames Clipper, thanks)… To make matters worse, she revisited this argument as the boat reached Dartford later on, complaining that the logistics of building bridges at such a wide point of the river mean that we really would be better off building one upstream (a further crossing at Dartford is currently being considered as an option I believe). In a rather anxious moment, I formed the impression that the classic Gallions Reach or Silvertown motorway bridge plans are still upmost in the minds of the developers – when will these planners acknowledge that a comprehensive public transport system is the most sustainable way forward, surely there’s a lobby for that too? Ho Hum. She also suggested that we would be wise to buy properties in the Woolwich Arsenal in readiness for the Crossrail property bubble, adding insult to injury by apparently conflating development with gentrification – oh…my…gosh. In keeping with the apparent lack of balance, social housing never once got a mention. To make matters even worse, she added that she’d not been paid to promote the Arsenal developments – which aroused suspicions as to what she might have been paid to say, hence the concerns about road lobbying and one sided brainwash. Despite giving an apparently unbalanced speech, she did occasionally refrain from bigging up big builders to impart some genuine wisdom: introducing us to the RSPB headquarters, and responding to a complaint about the Dartford Toll by explaining that historically, most London Bridges were tolled, but due to their advanced age, toll expiration had occurred a long time ago (As you may know however, the Dartford toll was due to expire, but was retained instead and is now due to go up to £2.50). The waste expert was able to demonstrate some sensitivity towards local concerns, acknowledging the controversies that led to a 15 year planning application process to get the Waste Incinerator built in Belvedere. This is a new building, just east of the Beautiful Sludge Incinerator. He also pointed out the Yellow containers on barges sometimes seen on the Thames are waste carriers, many now bound for Belvedere. The boat then passed a hot air waste processing plant on the northern bank (beside Ford Dagenham), and then Frog Island, London’s old landfill site, so at least the Belvedere incinerator is in similar company. The panel went to some pains to sell incineration technology to the audience, bearing in mind that whilst incineration is possibly a sustainable method, these plants are routinely denied planning permission due to local opposition on air quality grounds, seeing opposition from the likes of George Osborne and Eric Pickles, at least in their own back yards. All in all, it was a fascinating if at times troubling boat tour, and now that the surprisingly beautiful interior of Woolwich Gala Bingo is closed off, and the Severndroog preservation trust are concentrating on opening up permanently, I would strongly recommend the trip as a local attraction if it runs next open house weekend. The political map of Shooters Hill has just been redrawn by the Boundary Commission as part of their proposal to reduce the number of MPs from 650 to 600. Having previously been part of the Woolwich West constituency from 1918-1983, and the Eltham constituency ever since, Shooters Hill could now, if the commission’s scheme is accepted, find itself part of a larger Eltham constituency that takes in two wards from the Bexley Borough: Blackfen and Lamorbey and Falconwood and Welling. This is highly likely to shift the local turnout in favour of Tory candidates in a seat that currently needs only the 25th smallest amount of swing to turn red into blue. In a response that acknowledges the new boundaries help Tories in a seat that Labour last won with a slim majority of 1,663, Clive Efford has commented that he will continue to campaign in this area as he has since the 1994 election. For further reading, see the Kidbrooke Kite who picked up this story earlier, and 853 for the bigger picture in the local area. Apple Day, 11am-4pm, FREE ENTRY. All are welcome at the Woodlands Farm Trust Apple Day. Come and celebrate National Apple Day with a variety of activities, including crafts, a treasure hunt, archery, face-painting, and pressing apples to make juice. There will be stalls selling local produce, including farm honey and home-made jams and cakes. A great day out for all the family. Entry is free, but donations are welcome – all money raised helps us to care for our animals. Christmas Fair, 11am-3pm, FREE ENTRY. All are welcome at the Woodlands Farm Trust Christmas Fair. Sip mulled wine whilst browsing stalls of local produce and crafts for early Christmas present ideas, or relax in our café while the kids enjoy crafts and games. A great festive day out for all the family. Entry is free, but donations are welcome – all money raised helps us to care for our animals. Can You Spy Da Spider? Self-guided trail around the farm. Free; drop-in. The Big Draw: Fantastic Animals on the Farm. Make your own fantastic creatures. Materials supplied. Free; drop-in. Sessions at 10.30am, 12pm, 2pm, 3pm. Farm Food Day. Try something new, eat something wild, have a go with our apple press and find out what’s edible and what’s not on the farm. Ages 6+. Drop in; £1 per person per session. Wildlife in the Woods. Fungal foray, fun and foraging for ages 6+. Will take place whatever the weather, so be prepared! Free; drop-in. Rubbish Monster Toddler Group, 10am-12pm. Rubbish Monsters, 2pm-4pm. Recycling the fun way, making monsters! Free; drop-in. Creepy Crawly Day. 10.30am, 12pm, 2pm. Bug-themed walks and activities. Free; drop-in. Things That go Bump in the Night. Starts 4.45pm for Talk and 5.45pm for Walk. Ends 7.30pm. A talk about bats, followed by a bat walk using detectors, and moth trapping. Ages 6+. Booking essential; £2 per adult, children free. Woolwich is getting “Back to Business” after the riots, and in response to calls to support local enterprise, it occurred that one way to do so might be to make a beeline for the Nigerian businesses that have, in some ways, helped to keep local commerce alive in the years between the exodus of the Woolwich Building Society, Royal Arsenal Co-operative Society et al, and the arrival of new investment from the council, Berkeley Homes and Tesco. For several years now there’s been more and more Nigerian shops in the SE18 area, and having followed the food related ponderings of local musicians Afrikan Boy and Tinie Tempah, the time seemed right to try out some West African cooking. I went to Palm Beach, which is opposite the swimming pool. The reception there was possibly the most good-natured I’ve ever had at a restaurant in this country, and the family that run the place provided a fun and detailed explanation of Nigerian eating and drinking. Broadly speaking there seems to be no wheat or potatoes, and key ingredients include eba (cassava), yam, egusi (melon seeds), beef (nkwobi is hoof stew), tropical fish, and enough scotch bonnet pepper to give you a long and pleasant afterglow. For drinks I tried Palm Wine and Nigerian Guinness, which is much stronger than the Irish type. Overall, I found the intensity of this style of cooking very enjoyable, and am looking forward to trying some more West African fare in the near future, probably at one of the other Woolwich restaurants. At Palm Beach, the cost of mains and drinks was £10-15 per person.